On June 19, 2013, the commemoration day of St. Hilarion the New, Metropolitan Hilarion of Volokolamsk, DECR chairman, celebrated the Divine Liturgy at the church of Our Lady the Joy to All the Afflicted-on-Bolshaya-Ordynka in Moscow. After the liturgy, Bishop Ambrose of Neftekamsk read out a congratulatory message from His Holiness Patriarch Kirill of Moscow and All Russia. Archpriest Nikolay Balashov, DECR vice-chairman, addressed Metropolitan Hilarion on behalf of the staff of the Moscow Patriarchate’s department for external church relations, the clergy of the church and all the concelebrants., “Having assumed in taking your monastic vows the name of St. Hilarion the New, Abbot of Dalmatus monastery”, he said, “you have sought to imitate his life” in learning from the best people of the Church, while imitating the fathers who were before him, obeying the will of the Supreme Church Authority without seeking his own elevation, advocating the Orthodox faith, doing true Orthodox theology and loving church art. “We wish you good health so that you could have strength to bear the overwhelming burdens the Church has placed on you and pray that the Lord may give you both cheer and courage so that the waves of temptations and despondency could never reach your sacred head”. Metropolitan Hilarion, in his address to the congregation said that on that day 26 years ago when he took monastic vows, he did the most important thing in his life. “It was the principal choice that defined all the following stages in my ministry, because I made that choice of my own will and all that followed were no longer manifestations of my own will but obedience to the Church which in various years entrusted me with various tasks, sometimes one and sometimes several at a time. It is so today when I have to do various tasks, to work in various offices and to spend most of my time in planes and other means of transportation. It is not because I like it but because such is the instruction given to me by the Church”. He recalled the days when he took monastic vows and the hierarchs who were involved in his tonsure. “On this day my heart is filled with gratitude to God Who has chosen me for monastic service. And never, not for a minute, I have regretted that I have taken this path”, he said. 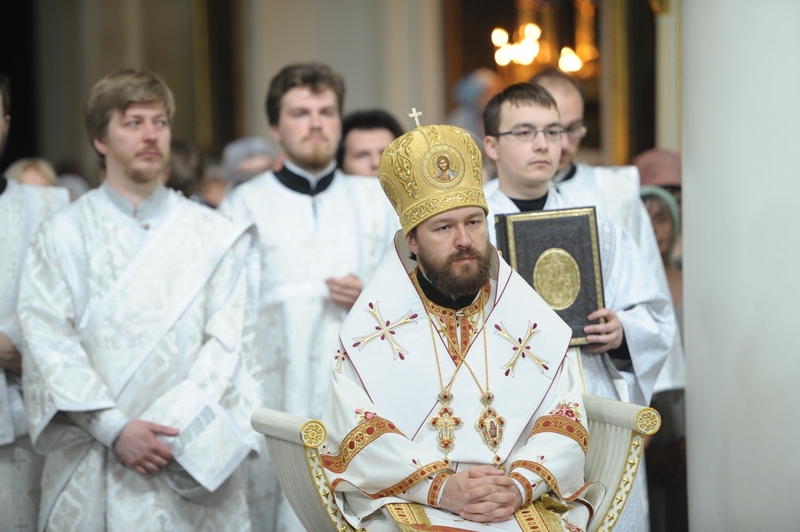 Metropolitan Hilarion thanked Patriarch Kirill for the confidence he showed in him by entrusting him with important tasks, his deputy heads at the DECR whose service requires self-sacrifice and all the DECR staff for their team spirit in the service of the Church, the clergy of the church of Our Lady the Joy to All the Afflicted for their efforts to adorn their church not only externally but also internally. Addressing the faculty and students of the ROC School of Post-Graduate and Doctoral Studies, he said the Church pinned hope on them as her future. His Eminence also noted that the day of his patron saint and tonsure coincided with the 75th birthday of his mother and read out a deed of His Holiness Patriarch Kirill who awarded her the Order of St. Seraphim of Sarov in recognition of her long-standing educational work and on the occasion of her 75th birthday.